Active hemorrhage with consecutive urinary bladder tamponade arising from bladder wall injury can be life-threatening and necessitates immediate hemostatic intervention. In rare presentations, patients demonstrate symptoms of coexisting hemorrhagic shock due to severe blood loss. Extravasation of intravenously injected contrast medium indicates active bleeding from large and small vessels. Contrast extravasation is well recognized as a sign of bleeding when using angiography and computed tomography (CT). Contrast-enhanced ultrasonography (CEUS) is based on the ability of microbubbles containing gases to produce real-time contrast-related gray scale images. This technique has been largely used in the evaluation of focal lesions in solid organs, which improves the lesion-to-parenchyma conspicuity. Some studies reported that CEUS could be used to reveal solid organ injury (M. Valentino et. al. Am J Roentgenol 2006; 186: 1361 – 1367), active posttraumatic intraparenchymal bleeding (F. Lv et al. Radiol Med. 2011; 116: 1076 – 1082) appearing as a hyperechoic jet that tends to pool dependently or to detect active bleeding in injured femoral arteries (W. Luo et. al. J Ultrasound Med 2006; 25: 1169 – 1177). In this report, we present a case of CEUS diagnosis of active bleeding into the urinary bladder in a patient with urinary bladder tamponade and clinical signs of hemorrhagic shock. 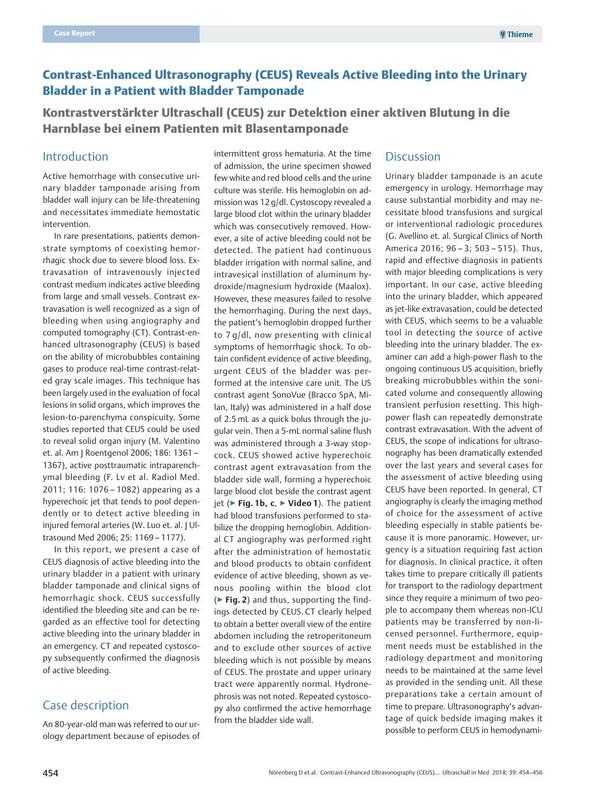 CEUS successfully identified the bleeding site and can be regarded as an effective tool for detecting active bleeding into the urinary bladder in an emergency. CT and repeated cystoscopy subsequently confirmed the diagnosis of active bleeding.